carriewriterblog: What is Your Communications Menu? What is Your Communications Menu? Over the weekend, I attended a local carnival. I had been to the same carnival the year before, and remembered that it really wasn't the rides that interested me, nor was it the raffle, since each ticket was a minimum purchase of $50, although this was for a chance to win a Toyota, or $15,000. Nor was it the games, since I already own quite a selection of stuffed animals and cannot rationalize one more bear or giraffe, as cute as they are. So why do I keep going to the fair? Because the variety interests me, and as an observer, I enjoy seeing what others like to do. It's not only kids, but parents and people of every age making a run for the ferris wheel, or the dunking booth, or even just hanging out in the front row where the musicians play. There are people trying hard to listen to the emcee for the day, who describes all the activities and promotions, while others could care less and keep talking over any announcements. There are people who buy the high priced raffle tickets, giving them a perceived value. And then there are those who will only take what is free, such as a balloon, a pen, a coupon, or a magnet or sticker. Then, there is the food. Hot dogs, burgers, chicken, fish. Steak, tamales, corn on the cob, salads, pasta. Cotton candy. Ice cream. Fudge. Pizza. I noticed at my table alone, not one person was eating the same thing, and they all seemed equally pleased. Some people were looking for the same food they had the year before, and were quite stubborn about it. Some children surprised their parents by wanting chicken instead of a hot dog, and some parents wanted to try something new. 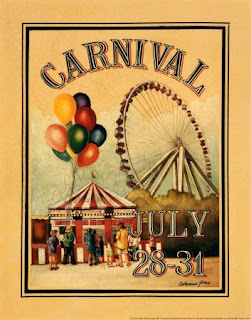 The truth is, if the carnival only offered the same kind of rides, the same foods, and the same booths, no one would go, or if they did, they'd be headed back home in an hour. Do you only offer a newsletter, when you could offer a blog or podcast as well? Do you only do printed communications without trying video, or slideshows? Some people may respond more to visuals, and make a decision based on how great they think a product looks, (think cool e-book cover graphic), while others are more auditory, and may rely more on buzz, or hearing an audio recording of what you or your product offers. So, when you have decided on your business message and your products, think about offering a variety of means that people can choose from in order to make the experience relevant to them. The more variety you have, the more comfortable they'll be likely to feel in making a purchase , subscription, or commitment to the services and community you offer. Maybe, like me, they need to try the carousel before the flying space ride, and maybe they need to sample the fudge before buying the whole cake. The important thing is that they stay with you, and that they keep coming back. If you offer the variety they need, it won't be long before they try something new, and better yet, let you now how great it was.